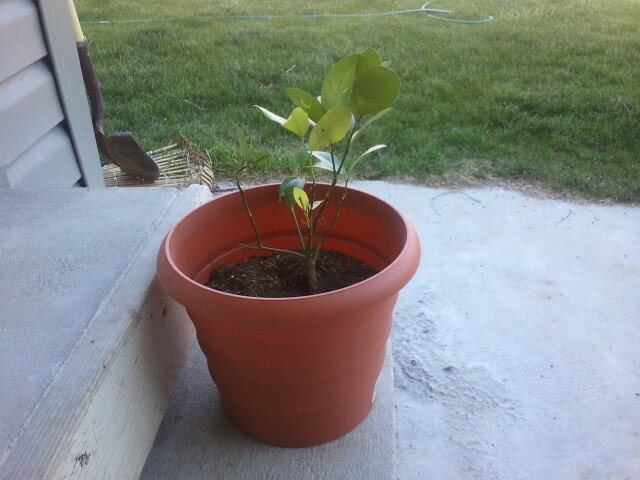 Introducing our lemon tree! I am really excited because I would love, love, love to find a way to grow citrus, and when I saw this little Meyer Lemon tree advertised in a catalog, which claimed that you, too, can grow lemons without living in a tropical climate, I had to give it a try. Let's be honest, my expectations are not all that high, but apparently, even though Idaho is what is known as a 4 or 5 zone (and citrus is usually expected in a 9-10 zone) if you don't let it stay outside in the cold, it can grow in its little pot and produce lemons! Oh, the possibilities! Since it is only hot, say, oh about 2-3 weeks a year in Idaho, I hope that it loves being inside our house right next to our window with the best lighting, and we will let it sit outside in the sun whenever possible. I am very excited about this little tree, and hope that we have success growing it. Hope all is well where you are--and that any planting/growing you do this year will prosper!